'They're always after 'me Lucky Charms!' 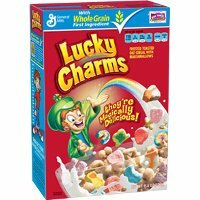 A favorite for more than four decades, delicious Lucky Charms cereal features frosted oats and colored marshmallows. Lucky the Leprechaun creates the marshmallow shapes hearts, moons, stars, clovers, horseshoes, pots of gold, rainbows and red balloons with his rainbow magic.